Going Trick o’ Treating? Don’t forget these DIY Monster Treat Bags that are perfect for Halloween! With a free template, these are super easy to make! Halloween is nearly here, and you know what that means – it’s Monster Time! Get ready to see monsters of all shapes and sizes – at your door, in stores and on your screens!! 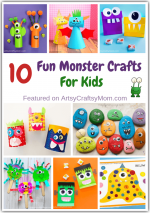 Monsters are one of the reasons we love this time of the year – so many Halloween crafts!! Yes, there are so many ideas when it comes to monsters. From quirky CARDBOARD TUBE ALIENS to cute Potato Print Monsters, from Giant Paper Plate Spiders to Vampire Bookmarks, there are just sooo many options!! So as you dress up as your favorite monster and stalk the town on Halloween, we know everyone’s got candy on their minds. Did you know that the average American consumes 1.5 kilograms of candy on Halloween? Yes – that much candy on a single holiday!! So let’s go a different route and give out non-candy gifts this year. 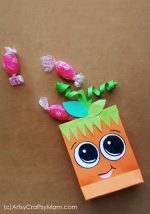 You could try some SUPER QUICK NON-CANDY HALLOWEEN MINI BOOKMARK TREATS, little bottle cap fridge magnets, or some cute and easy bird pencil toppers. And of course, such cute gifts deserve a treat bag that’s just as cute too, don’t you agree? 1. Select a colored craft paper and cut out a rectangular shape (14.5 inch x 8 inch). By keeping about 0.5 inch intact along any one side of the width, fold the 14 inch into half. 2. Apply glue along the 0.5 inch part; fold and stick the glued part with the other open end of the folded paper. 3. Fold up 2 inches of the folded paper from any one open ends; do not fold the closed ends. 4. Keep the paper on a flat surface and open the bottom side of it from one end; this will create a triangular pattern on that end. 5. Similarly open the other end of the bottom and flatten the open parts neatly. This will create 2 triangles on either end and two flaps on the two sides..
6. Hold any one of the open flaps and fold half of it downwards. 7. Similarly hold the other open side and fold half of it upwards, overlapping the open edge of the previous side. Apply glue along the overlapped parts to secure the bottom of the bag. 8. Notice the 2 squares formed on both sides of the bottom. Fold along the sides of these squares (left and right). Match the opposite corners of the squares on the sides of the bottom part to make a perfect fold along the left and right side. This will create crease lines on both front and back side of the bag and a center line for each pair of creases. 9. Open the folds and pop open the bag. 10. Carefully tuck the center line (on both sides) inwards and the bag will be ready. 11. From the template print and cut out the eyes and teeth you like. 12. Take the bag and fold 2 inches from the top open end. Stick the eyes on the folded part, keeping about half of the eye outside the folded part. 13. Similarly glue the other eye. 14. Glue the tooth inside (between the 2 parts of the fold) the fold along the top open end. One by one attach the other details of the bat to complete the bag. Allow the glue to dry. Your DIY Monster Treat Bag is ready! 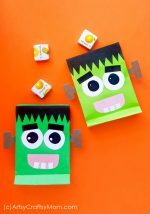 I just love how goofy these DIY Monster Treat Bags look! Make them with tough paper so that they’re sturdy enough to hold all your treats. Make multiple bags in different colors for all your friends, so when you go out together as a gang, you’ll all be matching. Happy Trick o’ Treating! 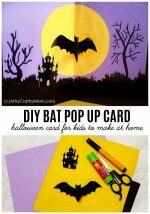 Don’t forget to check out these Halloween Crafts too! 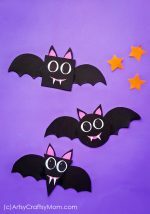 I cannot find the link for the template to go with the DIY Monster Treat Bags for Halloween. Help?